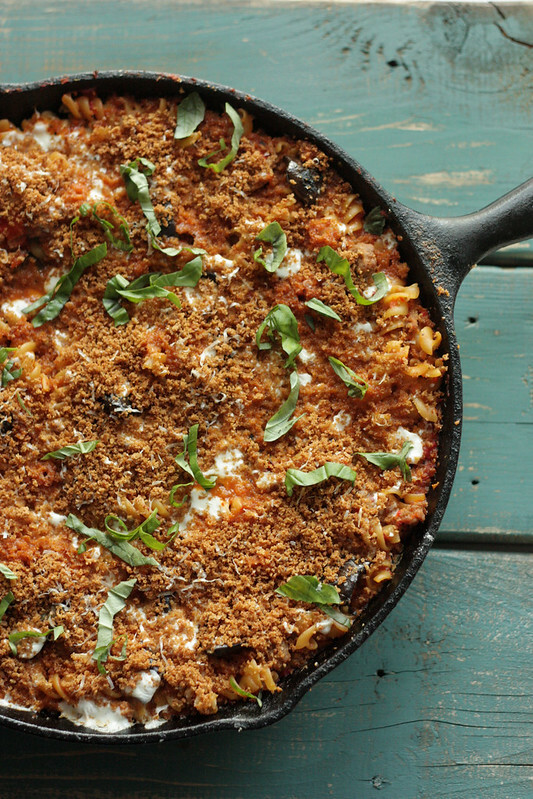 Skillet Pasta with Roasted Red Pepper Sauce and Eggplant – Elly Says Opa! Oh, pasta. So beautiful you could hang it on the wall of a museum. So convenient you could eat it in the bathtub. I love the gooey cheesy-ness, sweet-sweet tomato-ness, and of course the crispity, crunchety crust. Okay, so technically I am quoting a raccoon who is actually talking about pizza, but tell me it doesn’t work here too. I love pasta. A little too much. We have some variation of it (and, oh, aren’t the many variations one of the absolute best things about pasta, as a food group?) on a weekly or near-weekly basis. I like taking leftovers for lunch whenever possible, and one of the first, and easiest, things that comes to mind when I menu plan for that purpose is pasta. 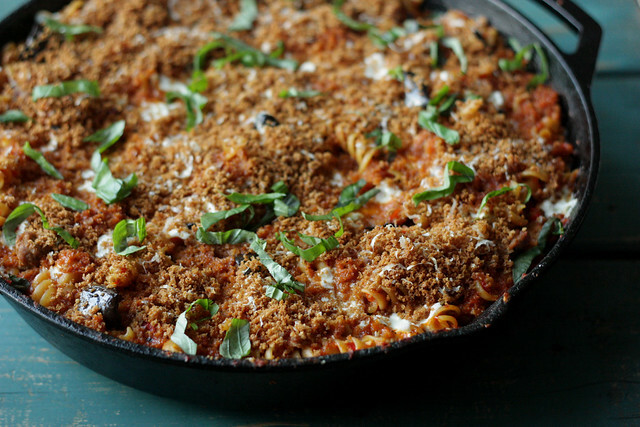 This dish is all made in one skillet, including cooking the pasta. Eggplant is not one of my favorite vegetables but it has grown on me tremendously over the years, and it works so well here. But one of my favorite things about this pasta is the sauce, which is made almost entirely from jarred roasted red peppers. It seems like it will be too…pepper-y, but it’s not at all. It’s just a great flavor profile, shining through just enough to make this pasta a little “different” than your normal all tomato-based sauces. This is a vegetarian pasta and hearty and filling on its own, but we’ve made it with chicken/turkey sausage added and that is great too (and stretches the servings a bit since it’s even more filling). Adjust the oven rack to the middle position and preheat to 400 degrees. Toss the panko with 2 teaspoons of the olive oil and season with salt and pepper. Spread on a rimmed baking sheet and bake, stirring often, until golden-brown, 5 to 7 minutes (leave the oven on). Let cool slightly and then toss with 1/4 cup of the Parmesan. Line a large plate with a double layer of paper towels. Toss the eggplant in a medium bowl with 1 teaspoon of salt and then spread it out over the plate. Microwave uncovered, about 10 minutes, stirring halfway through. The eggplant should be dry and starting to shrivel. Let the eggplant cool slightly before tossing it with 2 teaspoons of oil in the bowl. Heat 1 tablespoon of the oil in a 12-inch ovensafe skillet (I love cast iron) over medium-high heat. Add the eggplant and cook until well browned and tender, about 10 minutes, stirring occasionally. Return to the bowl. To the empty skillet, add the remaining 2 teaspoons of oil. Saute the garlic, red pepper flakes, and oregano until fragrant but not browned, about 1 minute. Stir in the tomato/red pepper mixture, 1 teaspoon of salt, and 3.5 cups of water. Bring to a simmer and then stir in the pasta. Cover, reduce heat slightly, and cook at a vigorous simmer, stirring often, until the pasta is tender, 12-15 minutes. If the sauce seems too thick, stir in the remaining 1/2 cup water. Stir in the remaining 3/4 cup of Parmesan and eggplant, and season with salt and pepper. Top with the slices of mozzarella. Sprinkle the panko mixture over the cheese and transfer the skillet to the oven. Bake until the topping is well-browned and cheese is melted, about 10 minutes. Sprinkle the basil over the top and serve.